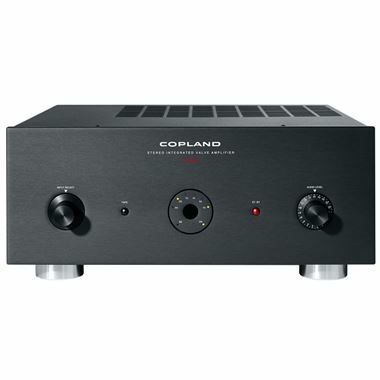 Copland CTA 405-A Integrated Valve Amplifier. Available with Online Finance and Free Delivery. The CTA405-A is an integrated valve amplifier with five line-level inputs, including a tape monitor loop, and a built-in RIAA phono circuit accommodating moving magnet and high output moving coil cartridges. The original CTA405 was launched nearly a decade ago and ever since, it has been an object of desire for audiophiles all around the world. The amplifier is now available in this improved and more powerful version, the CTA405-A - employing KT120 power valves and a dedicated power supply. The push-pull output stages consist of a pair of matched pair of KT120 power valves in fixed ultra-linear configuration, delivering the low distortion of triodes and the power of tetrode tubes. With a plate dissipation rating of 60W, a pair of KT120 in push-pull configuration can provide nearly 200W of power to the loudspeakers. When used in circuit designs of high bias current and a more modest power outputs, the amplifier can deliver an extraordinarily sound quality with incredible quantity of headroom and dynamic. The high power rating of the KT120 valves allows the output stage to run in highly biased class A/AB mode. To reduce the increased heat from the huge valves, a fan running at low speed has been installed inside the amplifier. In order to prevent any vibrations into the chassis the low noise fan is mounted with shock absorbers on a platform made from machined aluminium. The output transformers are critical components of the valve amplifier. Decades of experience in this particular field of audio electronics has been incorporated into the CTA405 output transformers, and excellent specifications can be measured at the full output power of 50 W per channel. The Copland transformers guarantees superb linearity reducing the requirements for internal lag compensation networks and ensuring high stability after the 18dB negative feedback loop is closed. The CTA405A employs motor driven volume control and can be fully controlled by the Copland RC102 remote control unit.